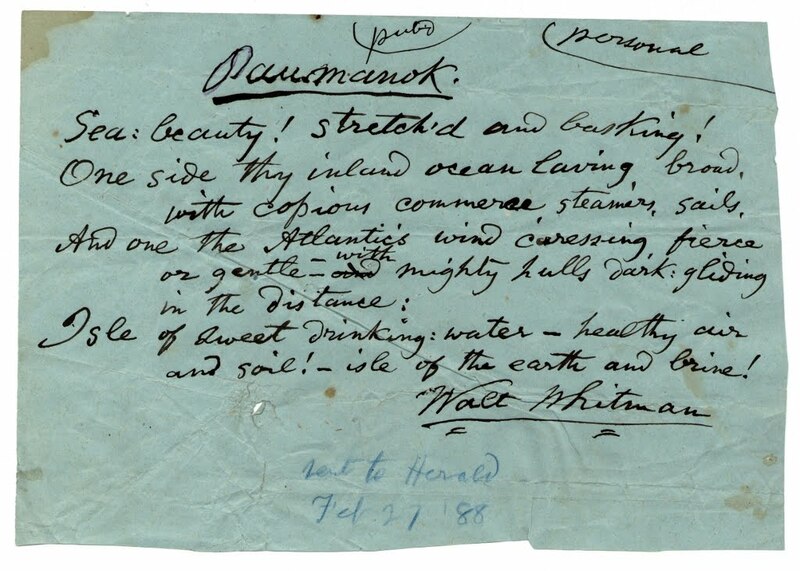 May 31st marks the 193rd anniversary of Walt Whitman's birthday, we are just a few years shy of his bicentennial. Whitman was born in West Hills on Long Island; the location is now the Walt Whitman Birthplace State Historic Site and Interpretive Center - an active place, well worth a visit, offering tours and poetry meetings. Though Whitman's reach was universal - in 1855 edition of Leaves of Grass (page 29) the poet introduced himself as - "Walt Whitman, an American, one of the roughs, a kosmos, disorderly, fleshly, and sensual, no sentimentalist, no stander above men or women or apart from them, no more modest than immodest"; he referred to Long Island in a number of poems. Today let us present a later poem, from 1888, "Paumanok", Paumanok was a native name of Long Island. Whitman still saw it as "Isle of sweet brooks of drinking-water—healthy air and soil!" hulls dark-gliding in the distance. Isle of sweet brooks of drinking-water—healthy air and soil! Isle of the salty shore and breeze and brine! "Paumanok" by Walt Whitman, first published in the New York Herald on February 29, 1888.